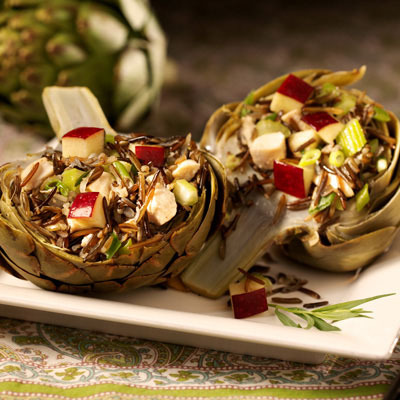 This elegant dish makes the most of two upscale California classics- wild rice and artichokes. Bring wild rice to a boil in medium saucepan. Reduce heat, cover and simmer until kernels just puff open, 45 to 50 minutes. Drain if necessary, and transfer to a bowl. Cover and refrigerate until well chilled. Meanwhile, bring 3 quarts of water to a boil in a large pot. Trim stems, lower leaves and tops from artichokes. Add 1 Tablespoon salt and artichokes to water. Reduce to a gentle simmer, cover and cook until a petal near the center pulls out easily, 20 to 30 minutes. Drain and cool completely. Halve each artichoke lengthwise, scraping out the fuzzy choke. Set halves aside. Add chicken, celery, apple, scallion and tarragon to wild rice. In a small bowl, whisk oil, vinegar, mustard and sugar until combined. Pour over rice mixture and toss well. Season with salt and pepper and divide mixture over artichoke halves.